/ Questions about Sleepy Head program. Questions about Sleepy Head program. My brother-in-law also uses a CPAP, and advised me to check stuff using Sleepy Head or some other program. I think I saw Sleepy Head mentioned somewhere in my paperwork, but it's my understanding that it is used with an SD card, which my old CPAP had, but my new one has a modem, so the doc's office calls the machine to download the info it's collected, then they review it, and then they contact me every week or two. I don't think my current machine has an SD card, but I could be wrong. Anyway, I'm not sure what I would need the info for anyway, as I am not the type to obsess over every detail of my health issues, or my treatments. Basically, my feeling is that if it works, fine. If it doesn't work, then I contact the doc, but I don't see a need to access every bit of data collected by the CPAP machine. My biggest concern was getting a mask that would work for me. The Amara View is that mask. I think what I want to know is: Do I need any of that Sleepy Head info, and if so, why? Also, if I do need it, can I access it thru my online medical account at my doc's office? RE: Questions about Sleepy Head program. Your Dreamstation has a SD card slot. It is located at a slot on the right side of the machine in front of the humidifier. A door opens at that location to allow you access to the intake filter. The smaller slot forward of the filter is the SD card. You should request a free copy of the setup manual. http://www.apneaboard.com/adjust-cpap-pr...tup-manual and download SleepyHead. Sleepyhead is free software that CPAP users use to see their data, every breath. I think your machine has an SD card which contains the data. Most people on these PAP forum have learned that professional care is inadequate so we have learned how to help ourselves and others. Thanks for the pix. That will be a help. Have an appt with my pulmonary doc later today for yet another follow-up. Quote: Basically, my feeling is that if it works, fine. If it doesn't work, then I contact the doc, but I don't see a need to access every bit of data collected by the CPAP machine. That's a very valid viewpoint and if it works for you, that's great. 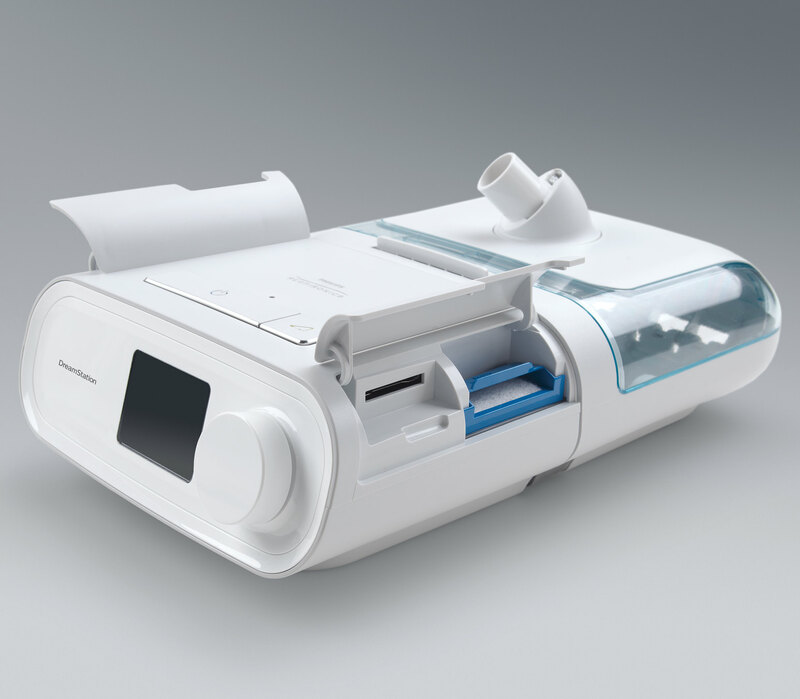 However the sad fact is that 50% of people who start on CPAP give up within a year. I feel that if they had proper follow-up and support, and doctors who would get into the detail of the problem, many of those people would go on to successful treatment. But when a doctor's day is measured in six minute slices he's never going to have the time to look at a patient's needs in detail. And when the system is designed to reward procedures and devices, not results, then there's no incentive for DMEs and such to spend more time than is necessary to sell you a machine and collect the insurance. That's why there are forums like this, and it's why Mark Watkins developed the SleepyHead software. It really is a brilliant program and gives you more information than you will ever need. You might have noticed that many of us here are engineers or other technical people and we are data-geeks. There's something magical about being able to look at a chart which showed every breath you took all night long! But if that sort of thing doesn't float your boat, that's fine. So long as the treatment is doing you good and you're happy with the service from your doctor then you don't have to get SleepyHead. But try it - you might like it! I am neither an engineer nor techie type but I love that I am in control of my own treatment and Sleepyhead is what allows me confidence to do that. While it is great to trust in your doctor realize that knowledge is power and the doctor you now like is not going to be in practice forever. Best to be informed before that day comes. When I started therapy and got immediate results I didn't question if I was receiving the best possible results, but I did want to know what information was being collected and I found Sleepyhead without reference from this forum. After 6 months of CPAP therapy I began to wonder if I could get more from therapy as in optimization and tailored results specific to me. That's when I found this forum and Sleepyhead is nearly a requirement to get individualized advice to get the best possible results from CPAP use. To each is unique and rarely, if ever, the same. As already mentioned above. Having the ability to look at your own data and being able to see the efficacy of your treatment can be invaluable when you are dealing with doctors and DME suppliers that are often satisfied with less than optimal results. When I saw my DME and was told that even having an AHI of 10 is a great result for many people and I was told to not make any changes for myself as I could cause my lungs to be severely damaged I knew I had to get some better answers than that. Hence why I ended up here and I am exceedingly thankful I did so! My treatment became much more comfortable and effective based on the advice of some senior members here such as Sleeprider and others.